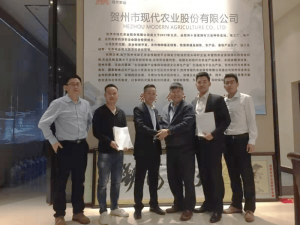 China, 19 December 2018 – i-Sprint Innovation (i-Sprint)’s China Office, An Xun Ben (AXB), signed a cooperation agreement with Hezhou Modern Agriculture Co to build an anti-counterfeiting, and track and trace platform to protect their agriculture produce using AccessReal Solution. Hezhou Guangxi is known as the “hometown of longevity in China” and has a reputation as a longevity city in the world. Hezhou Modern Agriculture Co., Ltd. is jointly established by a number of agriculture-related enterprises with more than 10,000 mu of farming land, factories, products and goods operations. The company is the developer and brand operator of all Shoucheng Hezhou landmark and speciality ecological products, and also the product processor and distributor of well-known, high-quality tourism agricultural product in Hezhou. China government has placed a high emphasis on quality and safety in food and agricultural products for export. To strengthen consumers buying confidence level, and trust in Hezhou quality products, Hezhou Modern Agriculture has appointed AXB as its technology partner to provide an anti-counterfeiting, track and trace, and consumer marketing platform (powered by AccessReal) that can help agriculture production companies in Hezhou City to protect their Hezhou branding against others. The AccessReal solution assigns a unique identification code (i.e. QR code) to all the agricultural products of Hezhou. The unique QR code label is pasted onto the product packaging. Consumers are able to use a mobile app to scan, obtain product information, and check product authenticity. All the scanned activities will be captured in the AccessReal system. The companies can use the information collected to detect any counterfeit, and understand their consumers’ purchasing behaviour better. To read the full Chinese write up on this, kindly click here.